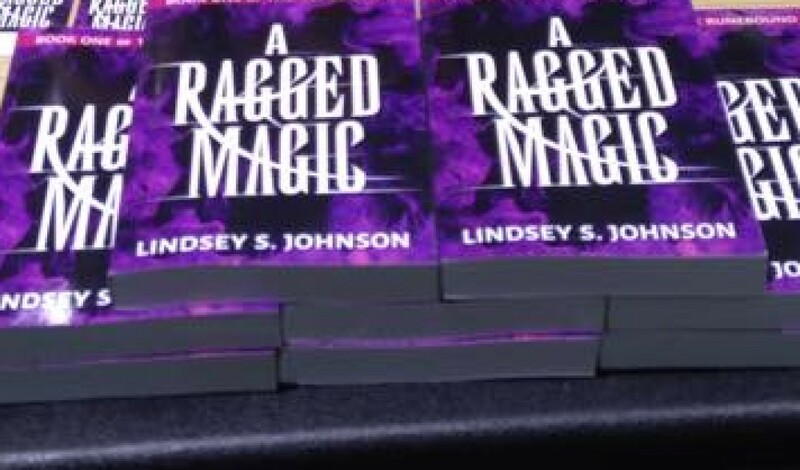 I’m just adding in a quick note to everyone that my book A Ragged Magic is back up for sale on Amazon.com as ebook – for $4.99. Soon the paperback version will be available for purchase, as well. So if you were looking for a little something to read, and you haven’t picked it up yet, why not give it a try? Look, it’s so shiny! “Orrin!” I whisper. “Orrin, come and talk to me. Where were you? What happened? Are you all right?” He turns and stares at me, his expression blank. I reach out to touch his arm, and he flinches. “Orrin?” I say, feeling helpless. “May I help you, my lady,” he says, but he doesn’t look at me, only at the air past my ear. “Should I, my lady?” He still will not look at me. I can’t tell if he means he should not know me, or he does not know me. This time he looks at me, and I reach for his arm again, but he moves back. The wine in the pitcher he’s holding sloshes. He shakes his head. “I don’t know you. I don’t know you, and you can’t help me,” he whispers. “Just stay away from me. Stay away, do you hear me? I can’t know you.” His eyes are fierce. I hear people coming, and I reach for him again. “Please just come with me,” I beg, and then he does move closer, and I feel a spark of hope. “I’m sorry,” he breathes, and then wine pours down the front of my dress as he tips it, stumbling, looking straight into my eyes. “My lady, I am so sorry. So sorry. Please, my lady, please forgive me,” he’s saying, and I don’t know what’s happening until I see red out of the corner of my eye. Gantry’s red feast robe glitters as it billows around him, as he grabs for Orrin’s arm. Orrin’s brown sleeve slides up a little. I see patterns in angry red and white, runes to match my own. Orrin begs pardon in a dead voice, his head low. I curtsey low, feeling Gantry’s eyes burn into the top of my head, and sweat drips down along my own carved patterns. I glance up to See Orrin’s scars glow a pale amethyst for a moment, see him flinch and gasp. Servants are coming through the corridor now, bearing food and drink. I choke on words, then stammer, “My Lord Bishop,” I say, and stop. What do I say? “Yes, the gown, I, I will go and change,” I say, and hurry down the corridor to an exit, any exit. I end up in the front hall, and then run to Julianna’s rooms, my lungs and eyes burning. My hands grip the wall, the stair rails, to keep me upright on my shaky legs. I was right. The vision was true, and I was right. I start to shudder and cry when I reach the safety of my own room. Oh, Keenan, help me. Help Orrin. I will have to tell Connor, after the banquet is over. But for now, I just want to hide. I crawl, wine-stained, into my bed and huddle in a ball. Another sacrifice to demons, but his runes burn purple. I remember to breathe just in time to pass out. Title is from “Hard Candy Christmas” by Dolly Parton because I just like that song. And Dolly.